The Fate Core system is flexible, hackable, and adaptable to any world you can dream up. 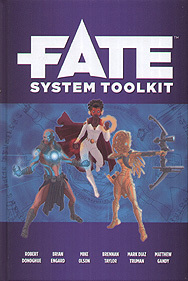 This Fate System Toolkit is packed with system ideas to bring those dreams to life. Learn how to hack the skill system to better suit your terraforming campaign. Get ideas on how to create races and societies for your woodland elves, subterranean aliens, or afterlife police force. Customize our magic starters to create you own system, and use our gadget starters to bring your gear to life (only not literally). Whatever genre you're gaming, you'll find a wide array of customizable concepts and optional rules in the Fate System Tooklit to take your campaign to the next level.